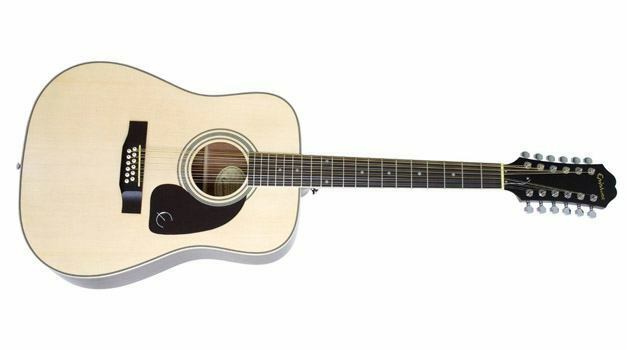 The Epiphone DR-212 is a 12 stringed version from the largely popular DR line of Epiphone acoustic guitars. With a full sized scale and a mahogany neck, it is an affordable 12 string for any musician looking for a beautiful sounding guitar on a budget. 12 string guitars typically run a minimum of $300, for lower end models. With these lower end models, quality is often lacking. So it was a surprise that the Epiphone DR-212 was such a solid instrument. The construction is typical of what you would expect from Gibson and Epiphone; a bit neck heavy, however overall, a very stable and well built guitar. The body itself feels extremely sturdy, and unlike other instruments in its price range, it does not feel cheap or “plasticky.” The wood is decidedly wood, and not a strange feeling laminate of some sort. The spruce top has a light satin finish, which gives it a “matted” look and feel. It is smooth to the touch, and yet it doesn’t have the sweat-slippery feel that most guitars get after long periods of playing. The spruce pieces chosen for the top are actually quite nice, which is a pleasant departure from some of the unsightly cheaper woods used in lower end acoustic guitars. Unless you have previous experience, a 12 string guitar is going to be quite a different experience to play. Because the strings are grouped in twos by octaves–instead of the traditional E A D G B E tuning, a 12 string is tuned E E A A D D G G B B E E–it may take some time to get used to fretting two string at once. Due to its tapered neck, the Epiphone DR-212 actually makes transitioning to a 12 string much easier. The action straight out of the box is decent, but it isn’t great. Since a 12 string is a much more complex instrument to play, a proper set up may be in order. There is very little fret buzz, but the intonation is going to be off, making strange and dissonant sounds in places higher up on the neck, until the intonation is set properly. For a 12 string, the Epiphone DR-212 sounds pretty average. There is no sparkling quality to the notes (it could have a bit to do with the stock strings), however the guitar does sound very big. With every note paired with its octave, each chord soars beautifully, as expected with a 12 string guitar. However, for its price range, the Epiphone DR-212 has an exceptional tone. For a budget guitar, it definitely reaches high.